Special Envoy Geir O. Pederson updates the Security Council on the situation in Syria. Special Envoy Geir O. Pedersen pointed to the importance of trust- and confidence-building between the Government and opposition, saying that Syrians from all walks of life “need to be engaged and involved in the effort to build confidence and trust, and search for peace”. “There will be no sustainable peace in Syria unless all Syrians are included in shaping the future of their country,” he said, echoing the words of the Women’s Advisory Board to the UN envoy, set up in 2016. Recalling the Sochi peace talks that established the Constitutional Committee, and the agreed-upon agenda of the UN-led Syrian political negotiations, known as the intra-Syrian talks, Mr. Pedersen asserted: “We are not starting from scratch”, but “it will require the readiness of all to deal seriously with the realities of the conflict and to work together to move things step-by-step in a positive direction”. The UN envoy said that he sensed “a wide acceptance” that a credible, inclusive Constitutional Committee, once established, could be “a door opener to a deeper dialogue and genuine negotiations”. He highlighted resolution 2254, which provides for a Syrian-led, UN-facilitated process to establish credible, inclusive and non-sectarian governance, saying that it contains all the “vital” elements for a political solution. Speaking to and cooperating with the Government and the Syrian Negotiations Commission, Syria’s umbrella opposition group, is the new UN Special Envoy’s “first and most important priority”. Mr. Pedersen took over at the end of December from the veteran Italian-Swedish diplomat, Staffan de Mistura, who had held the complex and demanding job of Syria envoy, since July 2014. Mr. Pedersen told council members he had already had “frank, practical and constructive engagements” with a host of different parties involved in the process, including the Syrian Government - with visits also to Moscow, Cairo, Ankara, Tehran, Paris, Berlin, and Brussels - and meetings with senior officials of key countries in Geneva, at the Davos World Economic Forum, and in Munich. 80 per cent are living below the poverty line. Half the population is unemployed. 11.7 million need humanitarian assistance. “Syria remains volatile for those who remain inside and for those who wish to return”, he said. With about half the country’s pre-war population displaced, much work also remains to be done over the fate of detainees, abductees and missing persons, according to the UN envoy, who cited the release of 42 either detained or abducted, as being of “immense humanitarian importance” and “an essential part of building confidence”. He also flagged that “socio-economic challenges are acute”, particularly for women who have often become primary breadwinners, and face increased forms of targeted violence. “There is no military solution and the true victors will be those who can move beyond slogans and paint a hopeful picture…even if the road towards it will be long and hard”, he asserted. He concluded on a note of optimism by drawing on his first-hand experience “that history can bend in directions that nobody anticipated”. 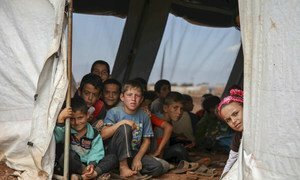 “Staggering levels” of humanitarian need persist throughout Syria, the United Nations Office for the Coordination of Humanitarian Affairs (OCHA) told Security Council members on Tuesday.